Francois Villon was born in Paris in 1431. The first thing that came up when I googled this guy was that he was a poet. I thought 'okay, this will be a pretty simple, perhaps not so exciting blog'. But then I kept reading and I grew more and more interested. It seems that good old Francois was more than just a poet. He was somewhat of a rabble-rouser. I think Wiki used the term 'Ne'er do well'. It all started on 5 June 1455. Francois along with two others - including a priest! - were in the Rue Saint-Jacques, when trouble erupted. In a scuffle a knife was pulled on Francois, who in turn drew his own knife. His assailant struck first, then Francois responded by stabbing his attacker. But he didn't stop there. To ensure his attacker would never again do him harm, Francois struck him with a stone, killing him. Now a murderer, Francois Villon fled. In his absence he was sentenced to banishment. He was later pardoned for this crime. 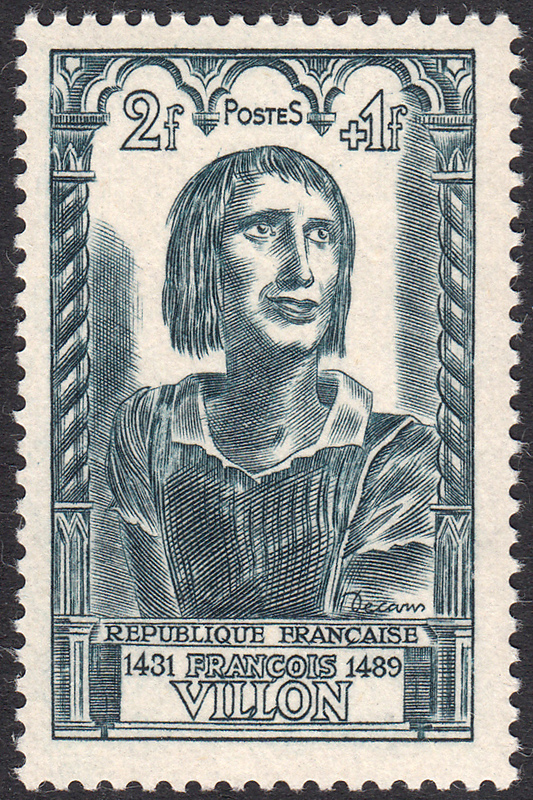 In 1946 France issued a set of six stamps commemorating 15th Century celebrities. Albert Decaris designed and engraved two of these stamps. 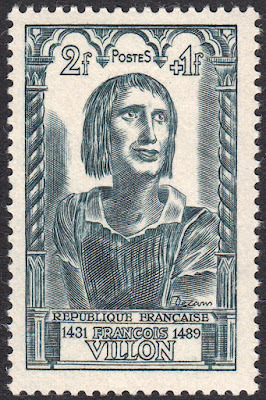 Joan of Arc (see my blog on this stamp HERE). The second stamp is the subject of this blog - Francois Villon. This is an interesting stamp depicting a rather colourful character. What is that expression on his face? Fear? Guilt? Contrition? Whatever Villon may be thinking here, I'm glad I got to meet this intriguing poet. The joy of stamp collecting!